Over the last few months, textBOX has been on a listening tour, speaking with disability service offices and publishers to understand the challenges and opportunities they are facing with delivering accessible digital content. We were inspired to learn more about university and publisher accessible digital content perspectives from our discussions at the 2018 Accessing Higher Ground conference. In this two-part article, we will take a closer look at university efforts to remedy accessibility issues with digital content and explore publisher progress in building accessibility into their workflows. The second article, due for publication in April, will focus on solutions to reduce time, resources and remediation costs at the same time as increasing equal access to accessible digital content. Visually-disabled college students depend on their disability service office (DSO) to provide training, support and accommodation as they pursue a degree in their chosen field. 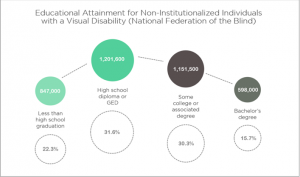 In 2016, the National Federation of the Blind collected statistics on educational attainment for individuals with a visual disability for the ages of 21 to 64 (NFB). The results, as shown in the graphic below, revealed that visually-disabled individuals are far below the US average. According to US Census data provided in 2017, 90% of all adults over the age of 25 have a high school diploma (Census.gov). 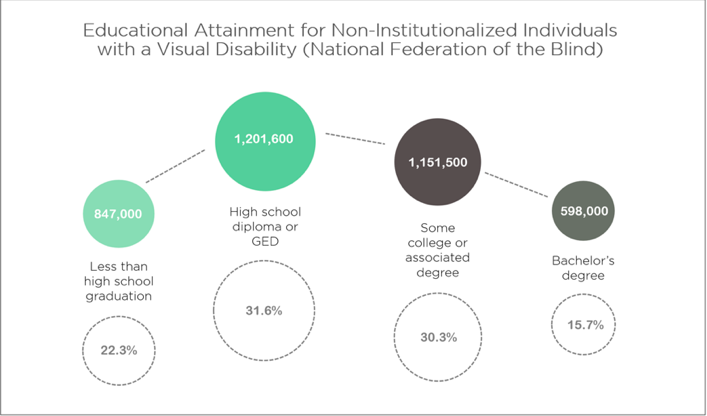 When you isolate the visually-disabled population using the NFB data, only 31.6% achieve a high school diploma. For bachelor’s degrees, the educational attainment statistics are 34% for all adults but visually-disabled individuals continue to fall behind the general population with only a 15.7% bachelor’s degree completion rate. How can universities and publishers work together to break down degree attainment barriers? It starts with ensuring that all students are set up to succeed on the first day of every course, irrespective of their ability. A current challenge to meeting this goal is that universities continue to receive content requiring modification before it can be used by visually-disabled students. This is happening because many publishers are still not producing content in the current EPUB 3 digital publishing standard format, which is universally recognized as providing the greatest opportunity for born accessible content. For those who are working with EPUB 3, many are not meeting the requirements of EPUB Accessibility 1.0 specification. Digital content is, therefore, often inaccessible and requires universities to intervene to fix the issues for their students. 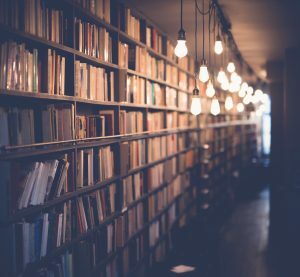 Additionally, while there has been progress in recent years with transitioning to a born-accessible publishing strategy for newly published digital content, there is still a vast amount of inaccessible legacy content used by university professors. Universities cannot depend on consistent delivery of accessible EPUBs and end up having to rely instead on an outmoded process of remediating PDFs. American universities have legal and ethical responsibilities under the American Disabilities Act (ADA) to provide equal access and educational participation for all students. To meet ADA requirements, DSO staff are required to evaluate individual student needs and procure alternative course materials where necessary (e.g., audio files, eBooks, accessible PDFs or Word files). This process begins when the student enrolls in the course and submits a request to the DSO. Since publisher content delivered to online retail websites is often inaccessible, DSOs cannot direct visually-disabled students to purchase their course materials through these sites. Where this is the case, they must obtain alternative digital formats from publishers directly or through intermediary services such as the AccessText Network. Unfortunately, the DSO’s responsibility does not end there. Racing against the clock, they must complete thorough content analysis and remediation to deliver materials that are at least functionally accessible for the student by the first day of class—this is their responsibility to their students. Wherever materials originate, as mainstream content or specialist format, there are still areas that need attention. Common issues that need correcting include: structural and navigational errors, manual digital format conversion for Text-to-Speech technology and missing or poor-quality image descriptions (alt-text) for visuals, such as photographs, tables, figures and graphs. Susan Kelmer, Alternative Format Production Program Manager at the University of Colorado, Boulder, finds that EPUB can be unpredicatble. 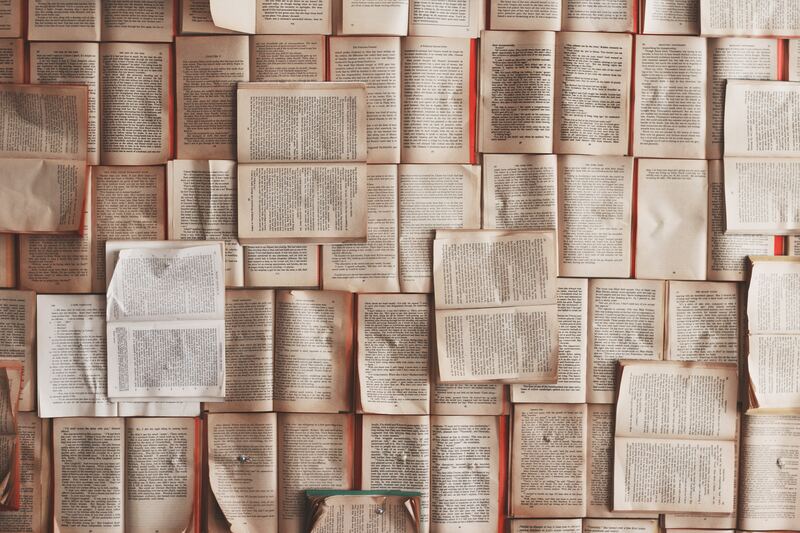 “Students with print disabilities (who are not blind) count on features like page numbering, and the ability to access the entire book in small portions with their technology (like being able to access a single chapter at a time). While there are some standards in place for EPUBs, not all publishers have embraced these. And for a student using text-to-speech technology, as long as the EPUB can’t be read out loud and navigated effectively, that becomes a full stop. The EPUB must then be dissected and compared to a hard copy of the book in order to get all of the elements back into the document.” Kelmer’s point is key to the successful implementation of EPUB workflows. EPUB industry standards and best practices address structural and navigational issues and eliminate the need for universities to remediate content. Publishers must adhere to EPUB Accessibility 1.0 standards so that the whole supply chain can benefit from the additional features of EPUB. However, until they can do this Susan prefers the predictability of remediating PDFs because she can feel confident that the turnaround time will be 4 days or less. The CU Bolder DSO often has tight deadlines and does not have time to sort through time consuming issues. Why are inaccessible course materials adopted by instructors in the first place? While a policy of “academic freedom” provides for instructional choice, it can significantly impact the DSO when the policy does not consider accessibility. It is, therefore, important for universities to adopt an accessibility policy that achieves the goals of the ADA. Universities should also require publishers to contractually meet roadmaps and deadlines within their mainstream EPUB files for student accessibility as a condition of winning an adoption. One of the most time-consuming tasks for remediating digital content is the process of writing image descriptions. Philip Voorhees, an Accessibility Specialist who has worked at numerous universities throughout his career, feels “the quality of image descriptions has improved over the last five years as publishers struggle with the level of detail, subject matter and context of the image within the text.” While the quality of image description has improved, publishers must continue to prioritize high-quality image descriptions to reduce the amount of content remediation work for universities and to improve learning outcomes. Publishers must also consider establishing a backlist content remediation process to help universities provide alternative formats for older titles that do not have image descriptions. Missing complex image descriptions in Science, Technology, Engineering and Mathematics (STEM) textbooks have a tremendous impact on the DSO and students. Jamie Axelrod, Director of Disability Resources and ADA Coordinator/504 Compliance Officer at Northern Arizona University, described a delivery experience last semester with a graphics-heavy Biology textbook. The student enrolled late and Jamie’s team did not have enough time to create complex image descriptions. They enlisted the help of the publisher but ultimately, they were unable to meet the deadline. The student struggled to catch up after receiving the course materials at the end of the second week and decided to withdraw from the course. Publishers need to understand the detrimental impact that incomplete course materials can have on a print-disabled student. The cumbersome process of delivering timely accessible content creates unnecessary dead ends for visually-disabled students pursuing higher education. Universities cannot solve this problem alone and need publishers help to create dynamic accessible content. Together, they can close the education gap and provide pathways to success. Digital products enable publishers to reach an evolving population of students who are regular consumers of digital media while, at the same time, reducing the negative sales impact of the used print textbook market. Digital products can also be widely distributed to a larger customer base through popular online retailers like Amazon, VitalSource and RedShelf. Online retailers are quickly advancing the accessibility of their platforms in line with industry-standard recommendations. This rapid progress puts pressure on publishers to improve the accessibility of their content so that they are not out of step with the retailers they rely on to expand their businesses. Furthermore, due to the inconsistency of accessible content, online retailers recently began highlighting the level of accessibility within their product descriptions to respond to customer demands, improve sales and stand out in a competitive market. For example, VitalSource now includes accessibility specifications on product pages to provide customers the ability to discover and select accessible content that meets their needs. Academic publishers are also competing with one another to develop proprietary platforms that offer immersive digital reading experiences to transform learning outcomes. These platforms are creating new possibilities for instructors to connect with students both in the classroom and online. If publishers do not uphold industry standards, visually-disabled students cannot participate or benefit equally from the transforming classroom experience. Publishers have begun to respond to the importance of creating born-accessible content and they have made tremendous improvements over the last few years. Bill Kasdorf stated in his recap of a 2018 Accessing Higher Ground panel session with the Big 5 (Cengage, Macmillan Learning, McGraw-Hill Education, Pearson and Wiley), “… [the Big 5] are not just working hard on accessibility, they’re getting it done. All of them are producing new resources as accessible EPUBs that align with the EPUB Accessibility 1.0 specification” (Inclusive Publishing). The Big 5 have forged a path for others to follow to resolve accessibility issues and respond directly to customer needs. This is just the beginning and more work needs to be done to reduce content remediation and improve the student learning experience. It is important to note that creating born-accessible digital products is not a simple or straightforward process. Many publishers have undergone a complete overhaul of digital production workflows and title management systems to address WCAG standards, simultaneously supporting multiple ebook formats and resolving proprietary platform accessibility issues. With expanding digital product offerings, new quality assurance and user experience testing procedures have been developed to ensure proper content functionality on platforms, browsers and devices. This is often a moving target with technological advancements that change industry standards and customer expectations. Since accessibility involves nearly every department within the publishing organization, internal committees and task forces have been established to prioritize accessibility projects and advocate for additional resources. Image descriptions have been a challenging endeavor for publishers. Many have not been able to get their authors to write the descriptions and there are limited editorial staff resources for this specialized task. Delays and complications due to clearing third-party image permissions have relegated writing image descriptions to the end of the publishing process. This results in publishers having limited time to focus on the creation, review and editing of this critical content. 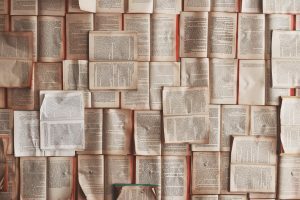 Additionally, outsourced production vendors have also struggled to deliver quality and consistency, especially for complex images, creating costly remediation work down the line for publishers and universities. Publishers are indeed focusing on advancing accessibility by making improvements to the most accessible industry-standard ebook format, EPUB 3. While industry standards and best practices may not address every need for print-disabled users, they do create a unified approach and direction that promotes change, accountability and progress while increasing equal access. To prioritize EPUB 3 implementation, many publishers have made a strategic decision not to provide accessible PDFs that would tie up valuable resources. The PDF format dates to 1993 and, despite its familiarity and ubiquity, missing image descriptions creates a poor reading experience for users. The low university demand for EPUB 3 in exchange for PDF makes it difficult for publishing organizations to build a business case and allocate resources for EPUB 3. This ultimately creates a vicious cycle for both publishers and universities and has inhibited the widespread adoption of born-accessible EPUB 3 content. While it is acknowledged that we must be in a transitional stage until publishers can deliver fully accessible content and platforms, visually-disabled students should not suffer from delays as a result. Publishers must prioritize accessibility and expedite solutions to eliminate the need for universities to provide PDF stop-gap measures. If students struggle to gain access to information, publishers and universities are setting up barriers to achieving educational goals that have an impact on long-term employment prospects. According to the National Federation of the Blind, only 29.5% of non-institutionalized US individuals with a visual disability between the ages of 21 and 64 were in full-time employment in 2016 (NFB). This statistic is clearly unacceptable and can only be resolved by publishers and universities working together and committing to action plans for change. In the next article, we will explore solutions to eliminate content remediation, help publishers build a business case that propels born-accessible publishing and establish a sustainable action plan for inclusive higher education. By working together, we can disable barriers and enable learning. One of the most challenging aspects of accessible publishing is understanding how to write immersive image descriptions for visually impaired and print disabled readers. Content providers are often uncertain about where to begin and how to integrate description work into their publishing process. The images included within digital content often remain silent to readers listening in audio format through screen readers, thereby negatively impacting learning outcomes and the joy of reading. Legal, educational and commercial pressures are intensifying for content providers to now prioritize accessibility. Although resources and guidelines are readily available to help content providers establish accessible production workflows, the lack of available image descriptions continues to be a significant barrier to readers. For content providers, the decision comes down to choice. Who should create the descriptions for image content? Should it be the author of the work or a member of the editorial staff? Due to the complexity of the methodology, should it be outsourced to a specialist in a similar vein to indexing? Publishers may delay decision-making as a result of this predicament and elect to keep generic, inadequate and incorrect alt-text “image” tags. Microsoft Word includes a publishing tool for automated alt-text. For Hiroshige’s image, Word automatically assigns the following description: “A picture containing building, fence. Description generated with very high confidence.” This incomplete image description highlights the current limitations of alt-text automation. So, what is the solution if publishers are struggling to find the best way forward and automated technologies generate deficient descriptions? textBOX addresses this challenge. We have a long-standing publishing background and a passion for promoting access for all readers. The industry needs a simple, workable approach to image description and textBOX delivers it. The objective of textBOX is to marry the art of immersive description with a scientific approach towards data analytics while adhering to industry standards. textBOX’s solution is focus/LOCUS – a method for producing high-quality image descriptions. This approach deconstructs the image into key elements and builds the description using a pathway through individual components. The description becomes greater than the sum of its parts. 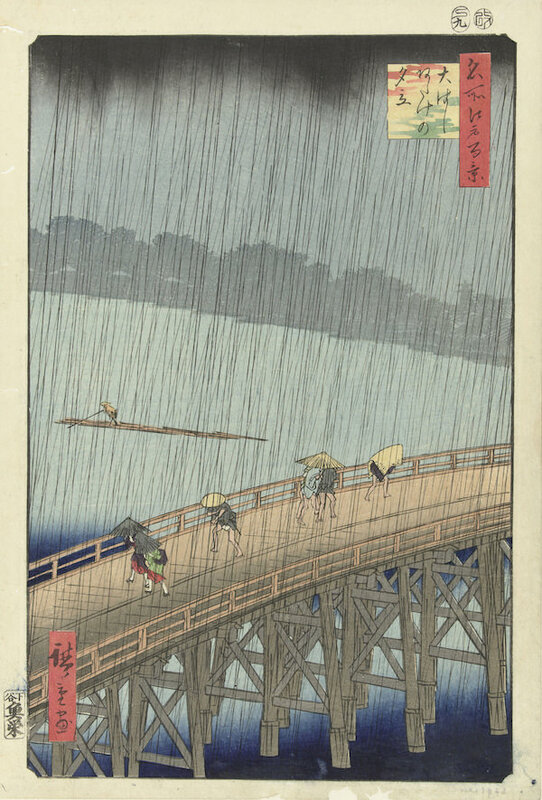 A woodcut print by Utagawa Hiroshige depicts figures scattering during a sudden rainstorm on the Shin-Ōhashi bridge in Edo (now Tokyo) in 1857. 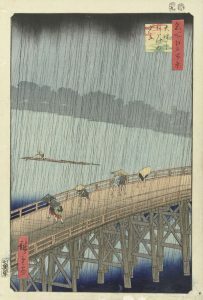 The foreground is dominated by a wooden bridge on which seven figures are hurrying to avoid a heavy rainstorm. Two brightly-dressed women are traveling from right to left on the bridge, sheltering under their umbrellas. A man is following closely behind them wearing a conical hat and ducking down beneath the downpour. Three figures hurry in the opposite direction, huddled under a single umbrella. Before them walks a hunched-over figure covering his upper body with a cloak. In the background, a boatman is steering his log raft along the river. A shadowy line of trees marks the bank of the river. The upper reaches of the picture are filled with ominous dark clouds and dark lines of rain streak across the face of the image. The positioning and postures of the figures in the image give a strong sense of movement and flight from the elements. The reader’s understanding is increased because they feel the image is tangible and they are involved in the story. “Writing useful alt-text is a bit of an art,” according to Google. (4) The objective of textBOX is to marry the art of immersive description with a scientific approach towards data analytics while adhering to industry standards. textBOX reveals to publishers that there is an opportunity to enrich their content and promote discoverability through image descriptions. textBOX is the product of late nights, wide-ranging conversations and meticulous research. The foundation of our business is built on listening closely to the issues that content providers are experiencing and learning from the expertise of industry leaders, colleagues and friends. The accessibility community is overflowing with innovation and collaboration and it is this sense of community that has inspired us to embark on this path. Inclusive Publishing plays a pivotal role within the accessibility community, the publishing industry and as a core resource for textBOX. We are delighted for the opportunity to share our thoughts and future goals through these pages. Image description is challenging but it is also a fascinating field. We look forward to listening to content providers and working with the accessibility community to develop solutions and build a future where every image tells a story and every reader experience is equal. For images, the sound of silence is far from golden. To learn more about textBOX please visit the textBOX website, read our inaugural soapBOX blog post, or write to us at hello@textboxdigital.com. This article was kindly submitted by Huw Alexander and Caroline Desrosiers, Co-Founders of textBOX.